Washington State football fans are all wet. For that, they have no one but themselves to blame, and no one but themselves to congratulate. Memorable football games have been few and far between the past decade-plus at Washington State. When bad football is combined with bad weather, WSU fans – like many, but not all, fan groups – tend to sprint/walk/waddle to the nearest sofa or watering hole to watch games on TV. Saturday night, in weather more suited for monsoon season than football season, WSU fans filled all but a few thousand of the 33,000 seats at Martin Stadium. The vast majority of those spectators stayed until the bitter – and we do mean bitter – end. The drenched human mushrooms who sat or stood for nearly 4 hours of football were treated to a marvelously entertaining, heroically played contest. Student-athletes from Stanford and Washington State took a break from their studies to perform on national television, and for that, we should be grateful. If you didn’t hear, the underdog Cougars lost to the eighth-ranked Cardinal, 30-28. WSU led most of the way, thanks in large part to Erik Powell’s five field goals in rotten playing conditions. On his sixth try, Powell’s 43-yard attempt sailed wide right, and the Cougars – ever burdened by the fact they have not had a winning season in 12 years – failed to secure their greatest triumph in recent memory. Still, the Cougars are 5-3 and need just one victory in the remaining four games to become bowl eligible. Also, WSU is 3-2 in the Pac-12 Conference and tied for second with Oregon in the North Division. 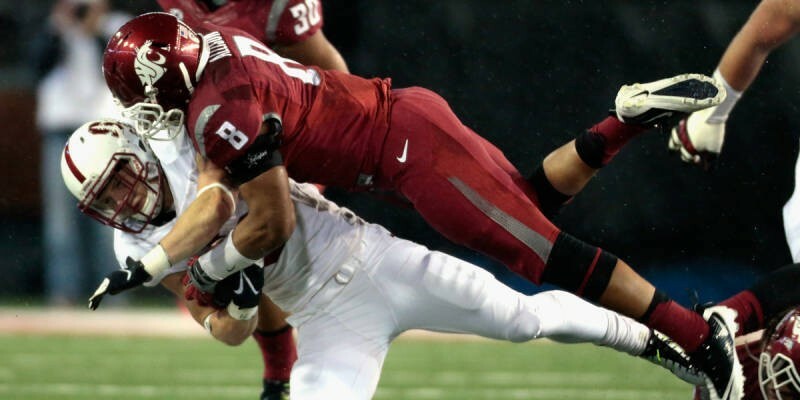 If you predicted the latter statement would be accurate two months ago, after the Cougars face-planted in an opening-game loss to Portland State – PORTLAND STATE! – you are a) a prophet or b) a liar. We don’t believe anyone would be wide right by picking b).